So it’s been almost a month since I posted anything chocolatey, and I think it’s high time this should be fixed. I mean, what is life without chocolate desserts right? And now let me introduce you to my newest love in the chocolate department: Chewy Fudgy Cocoa Brownies. 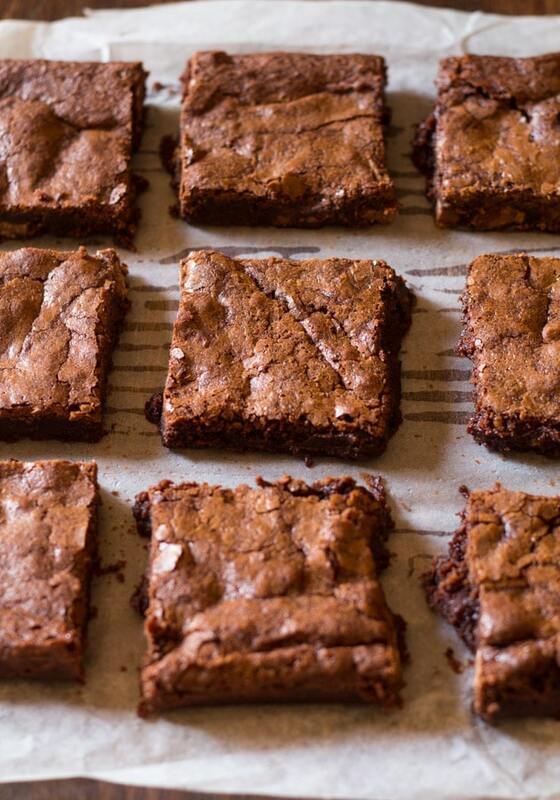 Now, brownies are the ultimate chocolate lover’s dream. And if you’re a regular reader around here, you must know by now that I have a passionate relationship with all things chocolate. And as a passionate enthusiast of chocolate, I absolutely love, love, love brownies. Brownies have a place for every occasion and mood in my life. Feeling sad? Bring out the brownie mix. Feeling happy? Bring out the brownie mix and add chocolate chunks. Feeling anxious before exams? Brownie mix + Chocolate Frosting. I’ve been blogging for more than a year now, and I’ve only posted one brownie recipe before precisely these Chewy Coconut Stuffed Brownies. And why is that? 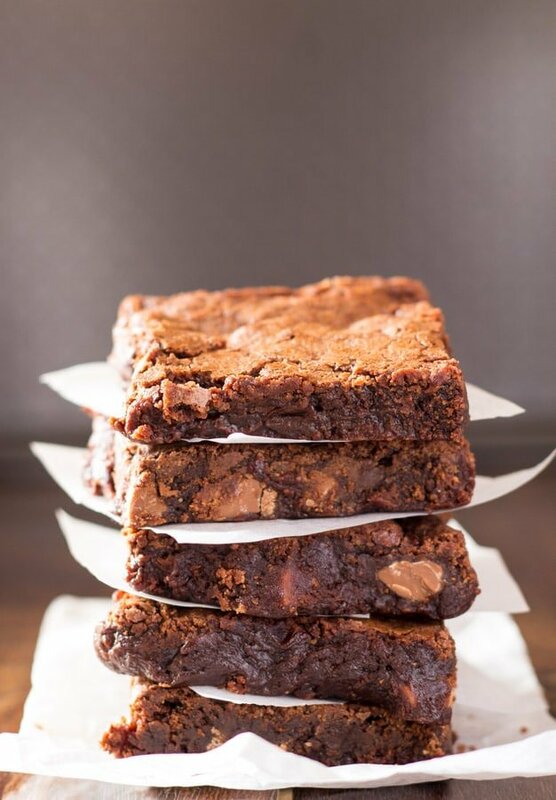 Because to date, all the scratch from brownie recipes I’ve made have not been able to match up the chewy and fudginess of those brownies that we get from a brownie mix. And trust me, I’ve tried a lot of brownie recipes, trying to find something to replace the brownie mix. I’ve tried brownies made from melted chocolate. I’ve tried brownies made from melted chocolate and cocoa powder. I’ve tried brownies made from chocolate chips. I’ve tried brownies made from all three: melted chocolate, cocoa powder AND chocolate chips. 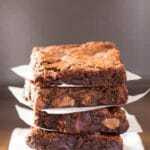 I’ve tried a lot of brownie recipes, and while it’s been fun carrying out such an important experiment, I’m happy to announce that these Chewy Fudgy Cocoa Brownies are a very close replica to the brownies we make from the mix. Yay! And they’re so simple and non-fussy too, and basically only slightly harder than making brownies from a brownie mix. 1.) Make sure to whisk the butter and sugar really well. I used a handheld electric mixer and beat the butter and sugar on high for about 1-2 minutes. 2.) After beating the butter and sugar together, add the eggs and beat for another 1-2 minutes, until pale yellow and fluffy. 3.) Once you add in the flour and cocoa powder, do not over mix. Just gently fold in until the batter is mostly combined, but you can still see a few streaks of flour. This is optional, but I added chocolate chunks into the batter. These Chewy Fudgy Cocoa Brownies are better than the brownie mix, and are so simple to make with just a few pantry ingredients required! Preheat oven to 350 F / 175 C and lightly grease an 8 x 8 inch baking pan, and then line it with parchment paper. In a medium sized bowl, combine together the melted butter, oil and sugar. Using an electric handheld beater, beat for about a minute. Add the eggs and vanilla, and beat for another minute until the mixture is fluffy about 1-2 minutes. Now add in the dry ingredients to the bowl: flour, cocoa powder and salt. Gently fold by hand, the dry ingredients into the wet ingredients until JUST combined. Do not over mix. Fold in the chocolate chunks, and then pour the batter into the baking pan. 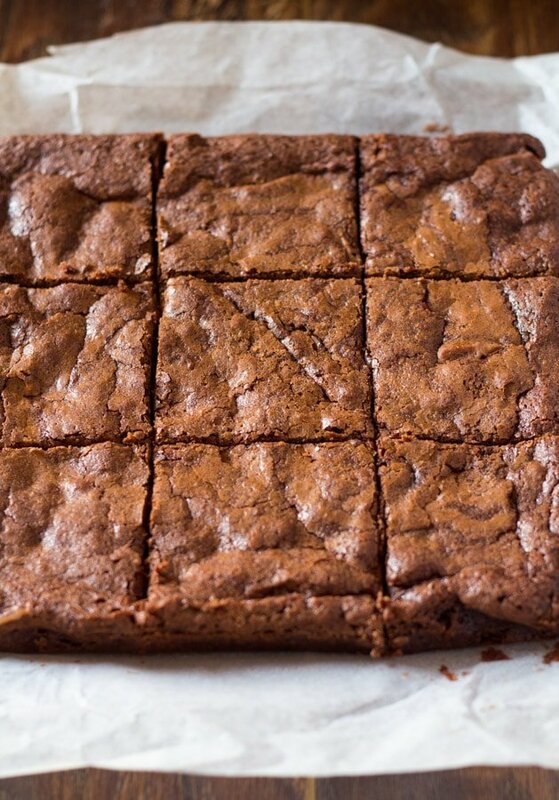 Bake for 25 minutes or until the middle of the brownies no longer jiggles. Be careful not to over bake, as the brownies will continue cooking in the hot pan once removed from the oven. Remove from oven, and allow to cool completely before cutting the brownies. For the pictures I sliced the brownies into 9 pieces, but if you want you can slice them into 16 pieces. Recipe adapted from Cafe Delites.